"Welcome to the D&D World." "Welcome to the D&D World!" With these words, one of the all time greatest series of co-op games began. 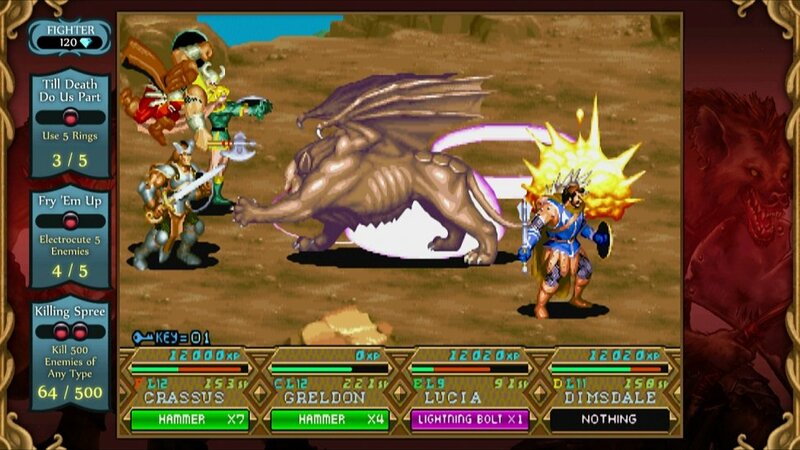 Chronicles of Mystara brings the classic brawling action from the 90s arcade right into your living room via digital download. How does the hack and slashing hold up today? Is there enough here to keep the interest of modern gamers? 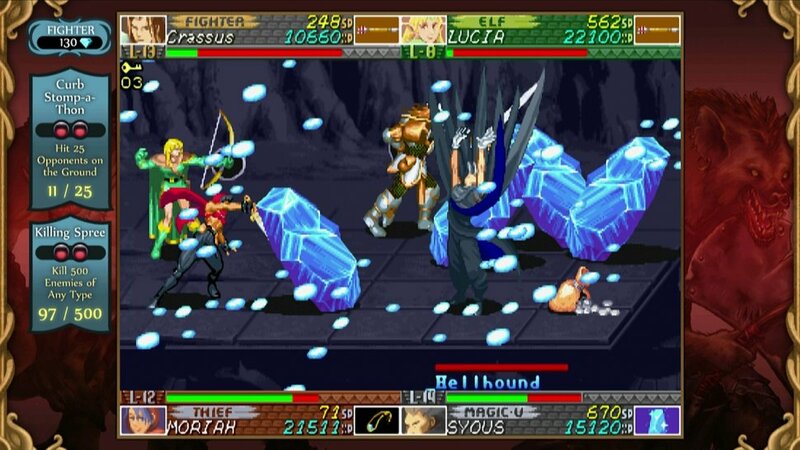 Chronicles of Mystara is a compilation of two classic Dungeons & Dragons arcade games. Tower of Doom was released in 1993, and the sequel, Shadow over Mystara, came three years later. Capcom was at its best during this time period, and both games are defining examples of the side scrolling co-op brawler. I won’t get into a detailed discussion of the game mechanics for the purposes of the review; if you are interested in more about the games themselves, check out previous features. It is worth pointing out that the depth and varied options that led to replayability in the arcades make these two games excellent candidates for modern release. Apart from the source material, then, what exactly is included in the Chronicles of Mystara package? One never knows what to expect when a classic comes to PC, Xbox Live Arcade, or Playstation Network. Lazy ports abound, but as the platforms have matured, more and more additional features make their way into rereleases like this one. 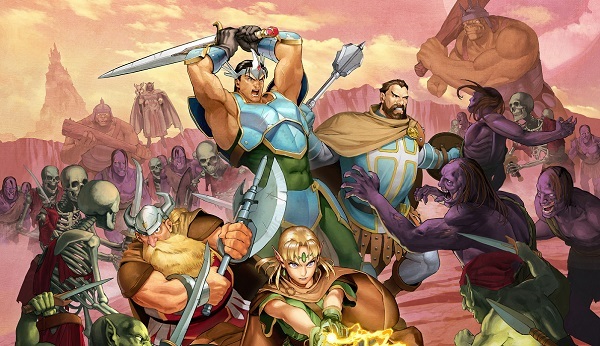 Chronicles of Mystara has received the deluxe treatment, with all the bells and whistles modern gamers expect, including a host of options, tweaks, bonus features, and even a leveling system that will keep achievement hunters busy for months. Only one thing is missing, as we will discuss later. How exactly does the leveling system work? Remember arcade games like NBA Jam that kept your record and other data from one session to the next if you signed in? Chronicles of Mystara has a very similar system. In true D&D fashion, players can level up as they enjoy playing both games. Performing specific tasks, like shooting a certain number of enemies with a bow, or using so many scrolls, earns players gems. The achievement system is tied into earning these gems, and gems further reward players by unlocking concept art, special game modes, or best of all, in-game power ups. Don’t like your items breaking all the time? Spend gems to purchase the ability to never lose another item. Other strong power ups include the ability to heal when dealing damage and increasing the amount of money foes drop when slain. The leveling system is deep, satisfying, and a great bridge between the game’s vintage charm and modern game design ideals. Page created in 0.4546 seconds.